Summary: Kelley Quinn is the owner of Nantucket's Winter Street Inn and the proud father of four, all of them grown and living in varying states of disarray. Patrick, the eldest, is a hedge fund manager with a guilty conscience. Kevin, a bartender, is secretly sleeping with a French housekeeper named Isabelle. Ava, a school teacher, is finally dating the perfect guy but can't get him to commit. And Bart, the youngest and only child of Kelley's second marriage to Mitzi, has recently shocked everyone by joining the Marines. I know! I know! It's still too early to be reviewing Christmas books, but hear me out! 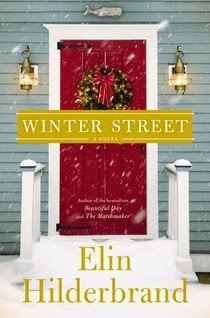 I love Elin Hilderbrand and her new book WINTER STREET came out last month. I actually waited a few weeks to read and review the book, so I don't feel as if I'm rushing the holiday season. Plus, you might have started your shopping, or at least getting together your gift ideas; and I wanted to share my thoughts about this book sooner rather than later! WINTER STREET takes place at Nantucket's Winter Street Inn where Kelley Quinn's life is turned upside down... right at Christmastime. Kelley is busy preparing for the inn's annual party, but the amount of guests is drastically down this year. He's wondering what the future of the inn might be. In addition, he has just discovered that his wife Mitzi has been having a long-time affair with Santa Claus! Add to this already crazy mix Kelley's four children... each of whom has their own set of issues. There's Patrick, the "perfect one" who is in trouble for insider trading. Kevin is having an affair with the French housekeeper; and Ava is a teacher who is desperate for her boyfriend to propose this holiday season. Finally, there is Bart, a Marine, who has recently been stationed overseas in Afghanistan. Things have never been more of a mess at the inn, so Kelley's ex-wife Margaret, the most popular nightly news anchor in the country, arrives in the nick of time to try and save the day. Can she keep things together long enough for the Quinn family to have a special Christmas? I am a very big fan of Elin Hilderbrand's novels, and while WINTER STREET was a fun Christmas book, I didn't feel as if it were up to her normal standards. That's not to say that I didn't enjoy it, because I did; and there were definitely moments where her great sense of characters and prose shone through. However, I did think the story was a bit predictable (but what Christmas story isn't? ), and I had some issues with the abrupt ending. WINTER STREET was an entertaining book though. It was a quick read for me, and I was definitely engaged for the entire story. I loved the descriptions of the inn and could picture the decorations and tree perfectly. In addition, I liked the humor that was woven into the story. In fact, WINTER STREET would probably make a great holiday movie. One thing that I did enjoy about WINTER STREET was the theme of family. Goodness knows, many of us have dysfunctional (or at least quirky) family members, and this novel had more than its fair share of them. However, the book showed the importance of family and coming together for the holidays. It was a sweet message and one that I will never tire of hearing/reading during Christmastime. I think it's best to pick up WINTER STREET just expecting an entertaining and sweet holiday story. And you know what? That's exactly what many of us need this time of year. Yes, Christmas stories are predictable but that's why I find them so comforting. You've got me curious about the end of this one. Sounds like it is going to be a good one. I recently read and reviewed this one. I really liked it, but I'm willing to bet that there will be a follow-up coming, this book just left too much open ended. This book was awful- I feel as though your review is influenced by the fact that you received a free copy. I've read all of her books and love them but this was left open ended and empty. Seems like she quickly wrote it for some cash.